I received the Music Beta by Google official download link yesterday after and was super excited about trying out the new music locker-room platform. The whole selling point here, which I believe is a great one, is that you can upload your music to Google Music and then access your music library from anywhere on the web. 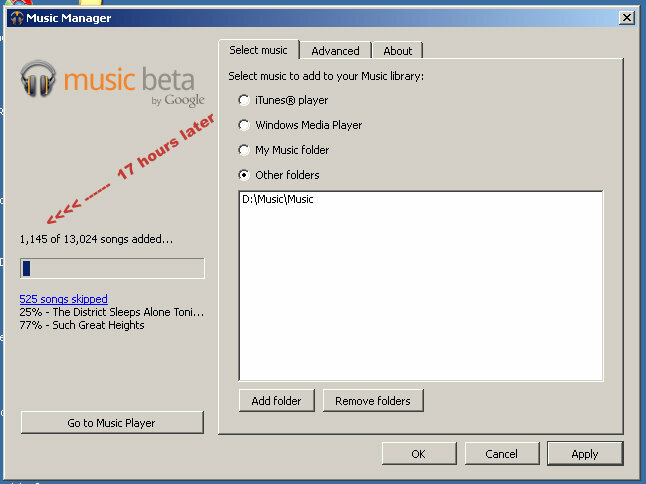 I wrote yesterday how Google Music could possibly even dethrown the all mighty iTunes. The upload and install went smoot,h and Google even threw in like 400 or so songs for free, which was cool. But the problems began when I started uploading all of my music to the Google Music platform. You see, I have well over 20,000 songs in my library and I was hoping to upload a small percentage of them into Google Music just so I can test it out both my computer and on my Android Galaxy S.
Problem is, I started the process of uploading songs at like 3 pm EST yesterday and here it is, 8:15am EST and I’ve only got 1,126 songs uploaded so far. The Google Music platform looks like it is uploading two songs at a time, giving a percentage of upload complete per song. And then, when one song hits 100%, the next song is initiated. Really? 17 hours later and I’ve only got less than 1,200 songs uploaded? Seems kind of strange to me. So the problem is either my computer and upload speed of my computer, or there’s something really wrong with Google Music. I don’t rule out my computer by any means. It’s not like I’m running an i7 iMac or anything. But still, only 1,200 in 17 hours sounds a bit out of the ordinary to me. What do you think? Are you having a different experience with Google Music? The one huge advantage I see that Google Music has over iTunes is the fact that once your music is upload to the Google Music locker, you can access your library from anywhere on the web. And your Google Music library can sync to your Android smartphone, iPhone, iPad, or any Android tablet. This makes listening to your music fast and easy, no matter where you are. There’s even a way to access your library is you aren’t online by downloading songs locally to your device – although I haven’t yet experimented with that because I’m STILL waiting for my songs to finish uploading. Ultimately, I’ll probably get tired of the upload process and cut it off at around a couple thousand songs or so… we’ll just have to see how it goes. And one more observation during my experience uploading music to Google Music. The computer I’m using to upload the songs is pretty much useless while it’s uploading the music. Apparently, my computer’s resources can’t handle the uploading bandwidth AND process other tasks.